Love the color of these small blooms. They are gorgeous! Planted in my rock garden. Love it! The dark purple color really stands out. I was worried at first that this plant wasn't going to make it because it took to long once it was shipped. But with a little TLC it is growing well. Doves Foot Geranium , Dowe's foot plants are high as they are produced in essential oils. These oils can produce great relaxation and can relieve anxiety and stress and also some depression. The leaves and flowers can also be created into an ointment and used on open wounds or neuralgia. The foliage of this plant can also be used in sauces and desserts. Doves Foot Geranium will bloom from June to September each year. Doves Foot Geranium are beautiful plants that add lots of bright color to any area. This plant will have smaller blooms and will be good to create beautiful spaces and also used as a ground cover. This plant is little maintenance care. It grows a lot in rocky regions and dry soil conditions. It can become 3 inches tall. This perennial thrives well in full sun will do well in various soil conditions. 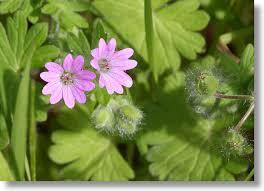 Doves Foot Geranium can be known as Dovesfoot Cranesbill. Doves Foot Geranium prefers to be grown in gardens that supply full sunlight. They add a fantastic look and also adds lots of colors as they are in bloom. These plants brighten up all gardens or natural areas where they are attached. They even do very well when planted in flower pots or containers. 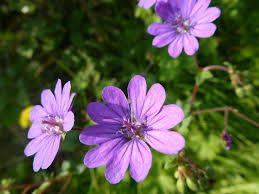 They thrive when planted in climate zones three through nine and are also called Geranium Molle by the botanical name. The leaves on this plant are shaped a lot like small kidneys, and the stems and leaves also are covered in fine little hairs. When in bloom the flowers are created by five small petals are usually bloom in a beautiful lavender or darker pink color. The leaves are brightly colored green. These plants are lovely for homeowners and gardeners as they take very little care to get them to grow and become beautiful. During the fall months, the leaves of Doves Foot Geranium usually turn to red.